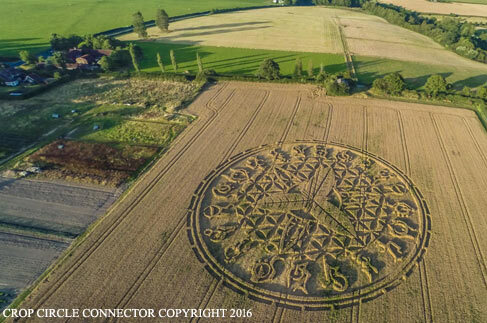 - Ian Halling, Computer Tech and Earthfiles Contributor, Gloucestershire, U. K.
September 10, 2016 Ansty, Wiltshire, England - On August 17, 2016, Earthfiles reported that the wheat pattern in Ansty, Wiltshire, U. K. — 14 miles southwest of Salisbury — is a match for the original MOTHERSHIP Glass logo created in 2012 by glass artists Scott Deppe and Jake Colito at a secret studio location in Bellingham, Washington. See: 081716 Earthfiles. Beginning in 2012, this is the graphic logo based on sacred geometry used by Mothership Glass in Bellingham,Washington, that is very similar to the Ansty, England, wheat pattern reported on August 12, 2016, below. 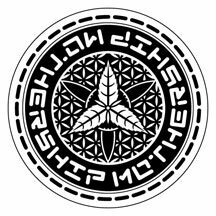 But the glasswork logo has different, straight line perimeter letters, “MOTHERSHIP MOTHERSHIP,” compared to the 20 intricate symbols in the large wheat crop formation below. Logo from Mothership Glass facebook page. Wheat field in Ansty, Wiltshire, England, 6 miles east of Shaftesbury, Dorset County, and 14 miles southwest of Salisbury, Wiltshire County, first reported publicly on Friday, August 12, 2016. Aerial © 2016 by Cropcircleconnector.